Digital storytelling is a creative and participatory practice which was invented to counter the expert-amateur gap and to achieve free expression. It typically takes the form of a workshop in which people produce short videos about personal experience with the help of media specialists. Researchers, activists and public institutions around the world have explored the practice’s potential to enable various social groups to have a voice. In this study, I carried out digital storytelling workshops for Chinese international migrants in Western Australia and Chinese internal migrants in Zhejiang, China, in order to reveal opportunities for having a voice that digital self-representation may provide to Chinese people on the move. Both participant groups formed migrant voices by producing digital stories that diverged from the entrenched socio-economic view on migration, although not always in a straightforward way. The formation of their migrant voices exemplifies how migrants’ takeup of digital technology may constitute the practice of cultural citizenship in the digital age. Jan He Zhang is a doctoral candidate at the School of Media, Culture and Creative Arts, Curtin University. Her research interests include digital literacy, creative and participatory media practices, cultural citizenship and migration activities of Chinese young people. Dr Frances Pinter, eminent academic publisher and recipient of a Curtin University Honorary Doctorate, will take us on a journey through her thoughts on innovations in scholarly open access publishing including initiatives she has started such as Knowledge Unlatched. Frances’s talk will be followed by a conversation with Director of UWA Publishing Prof Terri-ann White and Curtin University Librarian Catherine Clark – about the challenges and opportunities of Open Access in an Australian context. 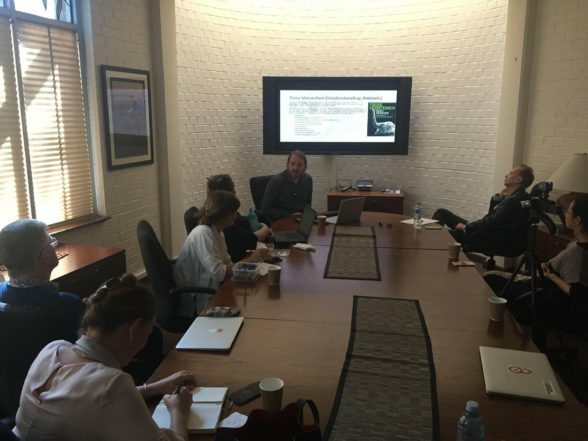 Knowledge Unlatched is a not-for-profit company working to create a sustainable route to open-access academic publishing for the benefit of institutions, publishers and readers. Through Knowledge Unlatched, an international consortium of affiliated libraries provides collective payments to help ‘unlatch’ books and make them freely available to readers worldwide via their open-access platform. At the age of 23, Frances Pinter was the first woman to establish her own publishing company in the UK. In the years that followed, she became a major force in the evolution of academic publishing. She has been a consistent trailblazer in the implementation and adoption of new technologies and business models that increase access to valuable scholarly outputs for communities around the world. In 2015, Dr Pinter was awarded an Honorary Doctorate of Letters by Curtin University for her contribution to scholarly publishing. She is an Adjunct Professor of Curtin University’s The Centre for Culture and Technology under its New Models of Publishing research program, and also runs Knowledge Unlatched Research. Catherine Clark, Curtin University Librarian. As an audio-visual medium, television can exclude people with impairments related to vision and hearing. Yet television can be redesigned to allow access by people with disability. For example, captions provide the text version of speech and other sound on videos to compensate for hearing difficulties. Similarly, audio description provides a spoken narration to describe visual content such as scenes, settings, actions and costumes included between bits of dialogue for people who cannot see it. While television access has been a priority for advocates for people who are Deaf and hard of hearing, audiences advocating for audio description are only recently making gains. These gains are frequently attributed to technological change, particularly the digitisation of television and the introduction of subscription video on demand where users access television content online and are not constrained by broadcast schedules. This paper uses the social model of disability to argue that these audiences members are not valued by broadcasters or governments despite the UN Convention on the Rights of People with Disabilities (which Australia ratified) specifically addressing questions of accessibility to information and media. New parents routinely invest huge amounts of time, energy and money in sourcing as much information as they can about good parenting practices. This investment includes a range of apps, from pregnancy apps which provide normalized information about what to expect on a day to day basis during pregnancy, through to various apped links to monitoring devices, both manual and digital, during pregnancy and infancy. Many of these apps now encourage parents to undertake specific monitoring and surveillance practices to capture large amount of data about their child. This data is often then aggregated by the corporations behind these reassuring apps – corporations which are driven by profit, and often see the aggregated data about the unborn or infants as a resource which can be aggregated, analysed and the outcomes eventually monetized. The commercial imperatives are often masked or overlooked by parents, who undertake this intimate surveillance with the very best intentions. In this talk, I argue against the widespread and indiscriminate push to track, survey, encode, aggregate and analyse a wide range of activities from conception to the early years of childhood. Tama Leaver is an Associate Professor in the Department of Internet Studies. His research currently spans ultrasound sharing and infancy online at one end, through to digital death at the other. He is @tamaleaver on Twitter, and online at www.tamaleaver.net. In this presentation I will interpret the Chinese Dream, the collective vision of national cultural rejuvenation that is promoted by the government in the PRC, its new territories along the One Belt One Road in Eurasia, and via media channels within the Chinese Diaspora. I will argue that the Chinese Dream devolves from a traditional understanding of culture (an essence) and technology (utility). The presentation explains how culture and technology have come together in the vison of the Chinese Dream. I explain the transition from a ‘scientific, mass culture’ under Chairman Mao to the current slogan of ‘mass innovation’. I will touch upon a range of issues within the Chinese Dream including the ‘going out of China’s culture’, the Internet + policy blueprint, the One Belt, One Road, Made in China 2025 (the Industrial Internet), and the challenges of managing innovation and artificial intelligence. Michael Keane is Professor of Chinese Media and Cultural Studies at Curtin University. He is Program Leader of the Digital China Lab. 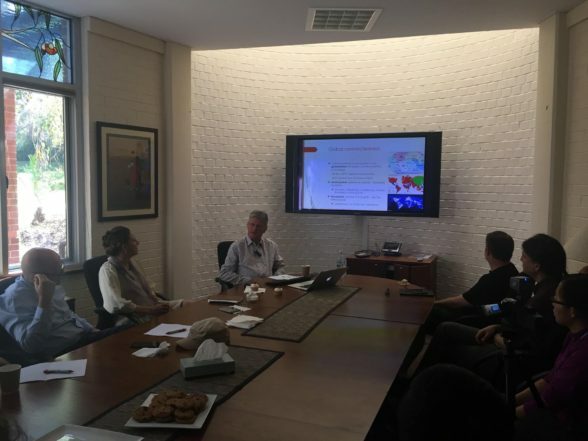 Michael’s key research interests are digital transformation in China; East Asian cultural and media policy; and creative industries and cultural export strategies in China and East Asia. In this talk we present an applied, deep-dive case study of efforts to identify and track the uses of Open Access (OA) specialist scholarly books at global scale, through the lens of the Knowledge Unlatched project. Knowledge Unlatched Research is engaging with the data generated by the larger Knowledge Unlatched OA monograph initiative to help libraries, authors, publishers and research funders to understand what happens to their books once they have been made OA; and to explore what changes (and what doesn’t) when open access licenses are applied to long form publications. We show that rather than being a disadvantage, many of the factors that make data about HSS books difficult to gather at scale are actually strengths. A diverse publishing landscape, a high-proportion of mission driven publishers, and libraries that care deeply about books and the communities that engage with them, are powerful advantages for HSS researchers. A/Prof Lucy Montgomery – is CCAT Director. She is also Research Director for Knowledge Unlatched, a not-for-profit start-up developing a new approach to funding open access book publishing. Alkim Ozaygen – is a PhD Candidate and Data Analysis Tool Developer for the TrISMA (Tracking Infrastructure for Social Media Analysis) project at CCAT. He holds Physics and Computer Engineering degrees and has experience developing infrastructure for Distance Learning in Higher Education. Machines encountered in people’s everyday lives are increasingly likely to be described as “intelligent” or “smart”. While humans have a tendency to anthropomorphise any machine, naming and talking to cars and computers, the response is even more likely for machines with a level of autonomy that imbues them with “liveliness” and “personality”. Arguments regarding how people relate to machines and how they might or should relate to machines in the future abound. Ethical questions are raised not only about the best way to design machines to interact safely with people, but also about the need to consider how humans should treat machines. 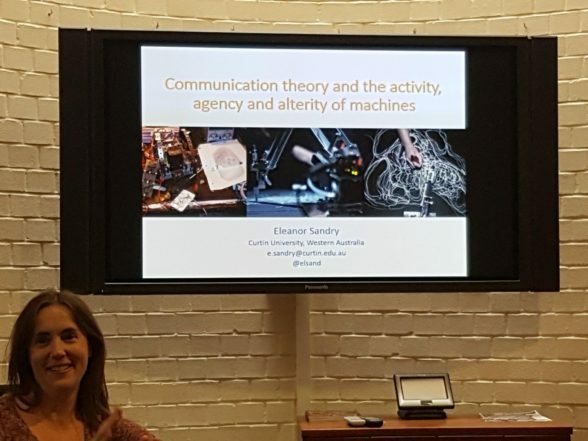 This talk explores communication theoretical and philosophical approaches to human-robot interactions that offer ways to understand the agency of machines, while continuing to recognise their alterity. 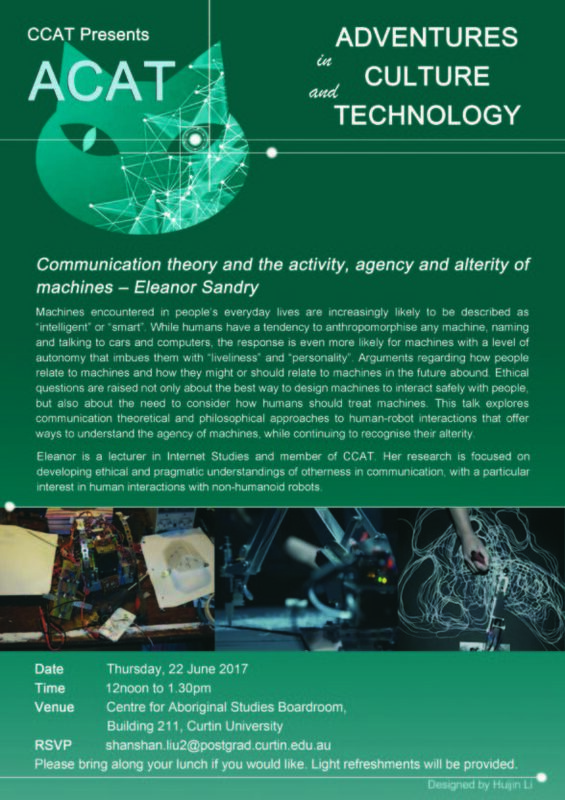 Eleanor is a lecturer in Internet Studies and member of CCAT. Her research is focused on developing ethical and pragmatic understandings of otherness in communication, with a particular interest in human interactions with non-humanoid robots. When philosophy and cultural theory have delved into the marginal subfield of zoo biology, it has usually been only to chastise it for turning wild animals into humanised artifacts. Rarely has it been asked what this science of mutual acclimatisation might have to say on wider issues. Yet today when the humanities are struggling with questions of human relations to animals and the environment, amid their intensification and mutual transformation in the Anthropocene, the knowledge, techniques, practices and even wisdom developed within this domain are worthy of sustained attention. Taking zoo biology seriously as a site of experimentation, however flawed, in multispecies relations, this paper will stake a claim for the wider cultural and philosophical significance of the work of the mid-twentieth century Swiss zoo director Heini Hediger. 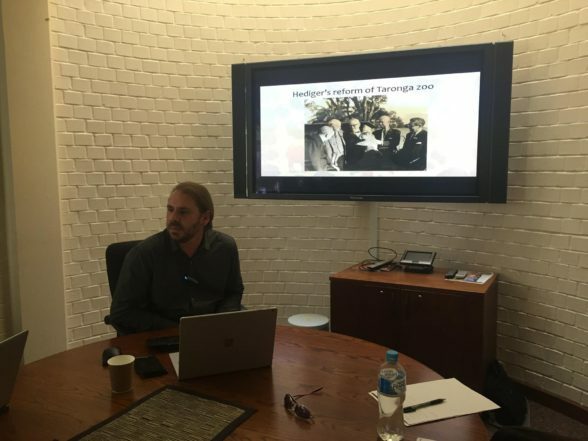 Matthew Chrulew is a DECRA Research Fellow in the Centre for Culture and Technology at Curtin University. 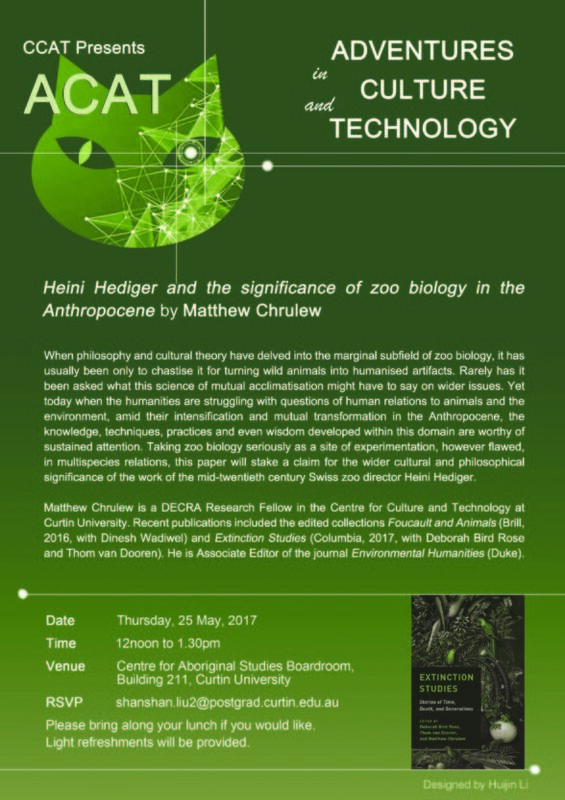 Recent publications included the edited collections Foucault and Animals (Brill, 2016, with Dinesh Wadiwel) and Extinction Studies (Columbia, 2017, with Deborah Bird Rose and Thom van Dooren). He is Associate Editor of the journal Environmental Humanities (Duke). What does it mean to be human? What does technology have to do with that? And how do we know where “we” stop and the non-human world – natural and artificial – begins? These questions are ever more urgent as human action changes the natural environment, while human labour is increasingly automated. What will become of us when robots achieve consciousness? The answers seem to depend much more on culture than on technology; and popular speculative fiction seems to be well ahead of formal scholarship in thinking them through. 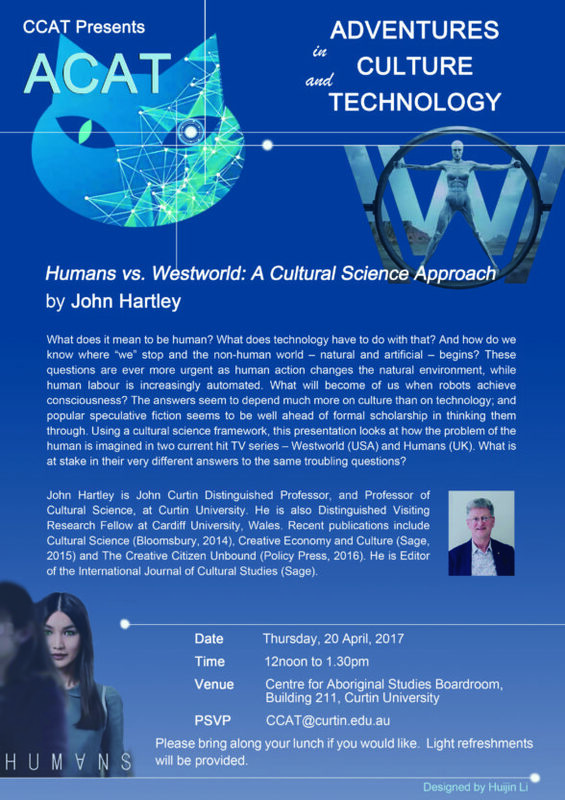 Using a cultural science framework, this presentation looks at how the problem of the human is imagined in two current hit TV series – Westworld (USA) and Humans (UK). What is at stake in their very different answers to the same troubling questions? 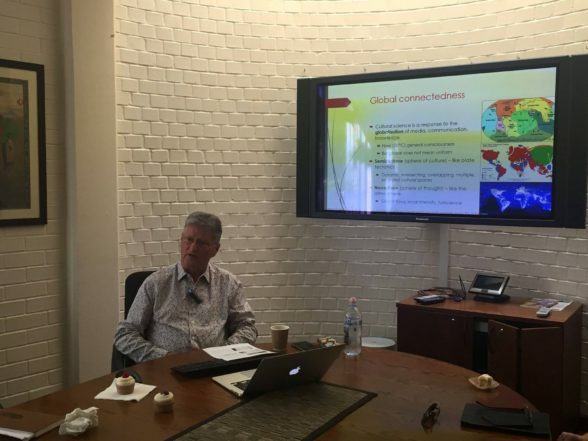 John Hartley is John Curtin Distinguished Professor, and Professor of Cultural Science, at Curtin University. He is also Distinguished Visiting Research Fellow at Cardiff University, Wales. Recent publications include Cultural Science (Bloomsbury, 2014), Creative Economy and Culture (Sage, 2015) and The Creative Citizen Unbound (Policy Press, 2016). He is Editor of the International Journal of Cultural Studies (Sage).